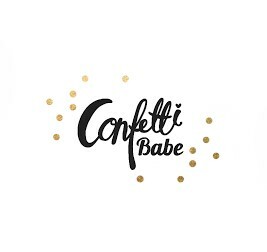 Happy Tuesday, ConfettiBabe Readers! I am a little late in posting this (what else is new?! ), but better late than never! Here is Amelia's 9 month update... three quarters of a year have passed for our little Amelia Grace! Where in the world has time gone? They were all right when they said "Time flies when you are having fun!" Sleeping Habits: What is sleep?! Bedtime routine starting at 7pm and in her crib by 8pm. She usually wakes up every 3-4 hours to eat (teething and MAJOR growth spurt) and a few other times to have her pacifier back and readjust. Amelia does not stop moving even when she sleeps! I never find her in the same spot I laid her down. We usually can get two naps out of her, but most don't last more than 30 minutes! Eating Habits: Amelia has three solid meals a day, plus snacks. She is still breastfeeding about 6 times a day but also loves her sippy cup of water! New Foods Amelia Tried: DAIRY!!! Amelia FINALLY outgrew her milk protein intolerance and we are having a blast trying tons of new foods! Pizza, Cheetos, cheese, ice cream, yogurt, chicken noodle soup, olives, yogurt, lasagna, chocolate chip cookies, and tuna were some of her favorites this month. Trying Lasagna and Yogurt for the first time! New Discoveries/Developments/Accomplishments: Amelia has mastered feeding herself by hand and hates when we try and feed her. We are working on using a spoon, but aren't having much luck. She LOVES her new sippy cup though! She also took us by surprise and started using a straw all on her own! On 11-3-14, Amelia randomly grabbed her Barnyard Sit/Stand toy and walked across the room. Completely took both Brandon and I by surprise! I am so grateful that she hasn't mastered walking on her own JUST yet and is still cruising along furniture or using mama's hands! Places Amelia Traveled: Grandpa/Grandma's house, Mimi and Papa's house, MOPS meetings, church, a craft fair AND Amelia got to go to work with mama a few times! Special Events or Holidays: We celebrated our first Halloween with Minnie Mouse! Amelia had a blast Trick or Treating at both grandpa Keith and Grandma Carole's AND Mimi and Papa's! She was so spoiled with new treats and a new sippy cup and spoons. New Friends: We finally got a playdate in with Harper this month! Her parents family have been an extension of the Koch's for almost 30 years. It is so special that Harper and Amelia are only 2 weeks apart! New Baby Babble: "Baby" and "Mimi" are the only clear words for this month. Amelia gets a kick out of finding herself in the mirror and saying "baaabeee" and playing her new baby dolls. Another new development is more consistent giggles! Amelia has the sweetest giggle and little voice I have ever heard! Likes/Dislikes: Amelia still LOVES bath time and would spend a good hour in the tub with her toys if I would let her. I enjoying giving her baths every night because hello... BABY MAGIC LOTION! They really should sell Baby Magic air freshener so I could smell squishy baby smell all day long. I wish I could say this has changed, but she still HATES getting in her car seat! She has started arching her back, screaming and crying every single time we put her in her seat. I am not sure why she hates it so much since she enjoys car rides (for the most part). Her latest obsession is a baby doll that my dad and step-mom bought her. She has one at our house as well, but doesn't seem to enjoy it as much. She holds the baby by the arm and swings it around, bashes it's head into the floor (ok... it's cute when she does it, promise!) and gives it tons of open mouth kisses! Parents Update: Brandon's business is really taking off and he is busier than ever! It's both a blessing and a curse because it means we can pay the bills but we see less and less of him. I was asked to come back to work at my old job a few weeks ago, so I am working Monday-Wednesday-Friday for the time being. Things are crazy and I feel like there aren't enough hours in the day... the house is a mess, I hardly cook anymore and I can't remember the last time I shaved my legs... but we make it work! We are having a blast playing with Amelia and getting to act like kids again!